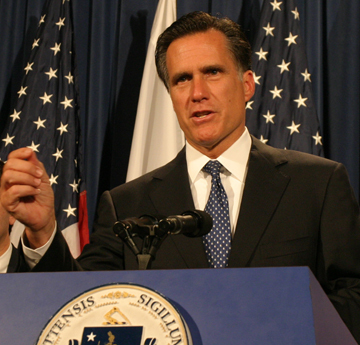 The file has been circulating online recently, but Buzzfeed has posted the McCain 2008 campaign’s entire 200-page opposition research file on Mitt Romney. Enjoy the light bedside reading. Arizona governor Janet Napolitano gets the nod for Secretary of Homeland Security. After the election, Kos commissioned a poll for a hypothetical McCain-Napolitano matchup for the Arizona senate race in 2010. Looks like Arizona Democrats are going to have to find another candidate now. Update: CNN reporting that Obama national finance chair Penny Pritzker will be Commerce Secretary. Update II: Pritzker tells CNN and other news organizations she is not in the running for the job. John McCain wins Missouri, the last undecided state on the map, two weeks after the election. The final count in the Electoral College is 365 for Obama and 173 for McCain. And there’s also this contradictory account of whether foreign policy adviser Randy Scheunemann (who would have likely been National Security Adviser in a McCain administration) was fired by the campaign for making disparaging comments to the media days before the election. Newsweek is out with the first installments of their traditional election special project, which is an absolute must-read chronicle of the public and private drama in the Obama, Clinton and McCain campaigns.